FILE - Thailand's PM Prayuth Chan-ocha gestures during his speech at the "Prosperity For All" Summit, the parallel event of the 30th ASEAN Leaders' Summit at metropolitan Manila, Philippines, April 28, 2017. The Thai economy, under the military’s stewardship for the past three years, is again witnessing steady growth but lags behind regional competitors as uncertainties remain, keeping foreign investors at bay. The World Bank and United Nations (UN) say the Thai economy is in a slow growth lane compared to regional rivals, with a projection of over 3.0 percent growth between 2017 to 2019. The UN’s Economic and Social Commission for Asia and the Pacific (UNESCAP) says the Thai growth outlook stands in contrast to Cambodia’s economy, which is set for 8 percent growth in 2018, Malaysia at 4.5 percent, the Philippines at 7.0 percent and Vietnam at 6.7 percent. A slow revival has been underway since 2016, in contrast to a sharp downturn in 2014 in the midst of political street demonstrations against the government of Yingluck Shinawatra, which eventually triggered a coup. Three years later recovery has returned, with first quarter 2017 growth at 3.3 percent, and business analysts saying the trend will be sustained. 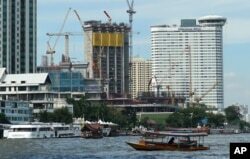 FILE - A riverboat taxi crosses the Chao Phraya river in front of massive construction projects, Jan. 18, 2017, in Bangkok, Thailand. Krystal Tan, Asia economist with analysts, Capital Economics, said the recovery will continue. “For a start the export sector will benefit from relatively string external demand,” Tan said in a market commentary. Capital Economics said the “current state of relative political calm” since late 2016 was providing support in areas such as tourism. The UN Economic Commission (UNESCAP) in a recent annual survey said the Thai economy “after years of uneven output growth record” regained momentum in 2016. UN economists said the key contributors were “robust tourism revenue” as well as government fiscal and budget measures through soft loans and tax breaks for farmers. But economists also say the unsettled political environment has undermined progress in economic reform and strengthening the competitiveness of Thai industries. Pavida Pananond, an associate professor of international business at Thammasat University, said the economy has under-performed over the past three years. “It’s not declining, but it’s not going anywhere. In three years the economy under the coup government has not improved much and now faces new risks that comes from the political situation of Thailand,” Pavida told VOA. FILE - Police stand watch as anti-coup demonstrators rally to mark the second anniversary of the military takeover of government, in Bangkok, Thailand, May 22, 2016. The Bank of Thailand, in its latest assessment for the March quarter, was upbeat. “Private consumption accelerated thanks to an increase in spending on durable goods, as supported by higher farmer income and greater overall consumer confidence,” the Bank said. But the economy’s “main driver” was still government spending, while private investment contracted in the March quarter, marking a reversal of previous periods. But Asian Development Bank (ADB) senior country economist Luxmon Attapich was positive recent gains would continue. “A sustained recovery in major economies, robust domestic consumption, and the continued implementation of large public infrastructure projects are the key reasons for (the ADB’s) projection,” Luxmon told local media. Thailand’s national assembly recently accepted a new constitution, setting the way for new elections in 2018. But analysts say a 250 member military-appointed Senate, including representatives from the armed forces along with pro-military political parties in the House of Representatives, will continue to hold sway and are in a position to elect the next prime minister. Thailand has been torn apart by political conflict over the past 16 years as populist parties, led by deposed Prime Minister Thaksin Shinawatra, have challenged an establishment centered on Bangkok’s urban middle class, military and bureaucracy. Pavida Pananond said Thailand’s political conflicts have yet to be reconciled despite the military’s calls for reform, leaving the added risk of Thai political instability. “Everyone knows that without the military, the conflicts and everything is still there. Without the guns all this conflict would rise up again. So foreign investors know that political instability is still there. The root causes have not really been addressed; reform or reconciliation have not really taken place where it should be,” she said. The military, in a bid to resolve issues of wide gaps in income and also to raise its popularity, has been promoting “grass-roots” economic stimulus programs. The government’s Pracha Rath project has looked to link local village communities with major regional department stores to offer products and boost local incomes. But analysts say the government has fallen short in pressing ahead with business reforms as part of its promoted vision towards a digitally advanced economy. The military is maintaining a tight grip over the media and social media, including a crackdown on the social media website Facebook, amid official concerns over commentary on the Thai Royal Family. Pavida said the attempts to block Facebook or seek out and warn people who view prohibited social media content sends “alarming signals to investors,” especially those focused on progress in the Thai digital economy.